Sanigar Events were once again in Newport, South Wales at the Newport Centre with a packed card. The main event between Craig “The Kid” Kennedy and Benki Mwakalebela, was called off a few days before, due to the African boxer failing a medical. It was too late in the day, to find a replacement but the quality card still went ahead. The show was aired live on Eurosport. The much anticipated debut of Andrew Selby, a Star of the World Series of Boxing and highly decorated amateur, didn’t disappoint. The Welsh boxer showed perpetual movement, in a lively performance in which he dictated the action in the opening two rounds. The ropes keeping Juma up in the first round. 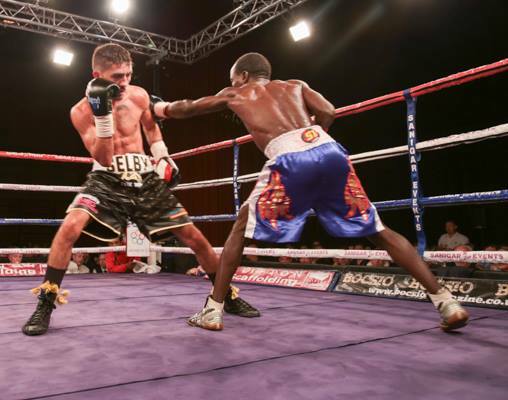 Selby, in an orthodox stance, showed beautiful check-hooks and rights. Beautiful to watch. Credit to the African boxer, he took some cracking shots and stayed on his feet. Two left hooks upstairs finally dropped Juma, who beat the count and was fortunate that the bell sounded. Juma the reigning UBO and African Flyweight champion, came-out on the front foot in the fourth but Selby moved fantastically and always evasive. Blurring hand-speed followed by a straight right hand, in the corner, brought the referee to step in and save the bedazzled Juma from any more. The African hadn’t won a round and found it hard to land a decent shot. 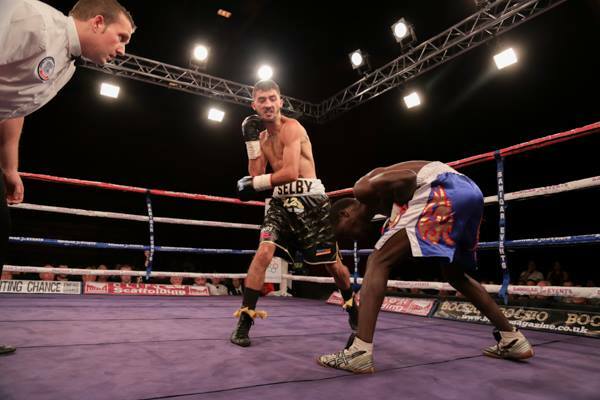 The impressive Andrew Selby starts his career with a win, and many more will follow. Juma is now 15-8-1, 7 KOs. In a contest for the BBBofC Welsh Area super welterweight title, Barrie Jones retained the belt in Newport. The bearded Lilley fighting out of the orthodox stance. Southpaw Jones, the defending champion, just edging a cagey opener. Left uppercut, right hand from Jones at the end of the round sealing it. Jones long left hand finding a home in the second. Quicker hands from Barrie, as he wins another round. Into the third and Lilley landing his own shots but Jones still taking the round, same again in the fourth. Aggressive start, to the fifth, from Jones who drops Lilley three times. Body-shots battering the plucky Lilley. The Swansea man tried to fight, to the end, but was ground down by a methodical Jones, who was digging in the body-shots. Barrie Jones record is now 22-10, 9 KOs while James Lilley’s record is now 7-6, 2 KOs. Tony Borg trained Griffiths the better and quicker, with hand and feet, in the first round. Effective orthodox jab and controlled boxing from the orthodox Griffiths in the second. Danni in complete control in the third and fourth. Winning every round on my card and that of referee Reece Carter (40-36). Another win for the St.Joseph’s boxer, who at the age of 20-years-old is developing nicely. Grainger came to win but was second best. Griffiths record now reads 7-1 while Grainger is 8-10, 3 KOs. Heavyweight Darch setting the pace and more active in the opening stanza. Scrappy second, the larger Olubamiwo unwilling to engage, so the two orthodox fighters getting tangled up on occasions, prompting the referee to have a word with them. Good use of left hooks, from Darch in the third. The Welshman aggressively starts the fourth but Olubamiwo surviving. Larry hit the deck, from a shot to the back of the head and allowed time to recover. Clear points win for Dorian Darch. Referee Martin Williams scored it 40-36 for the man from Aberdare. Darch’s record now improves to 10-4, 1 KO, while Olubamiwo’s falls to 11-17, 9 KOs. The come backing Arthur looking lively and throwing left-hooks like he’d never been away. A cut above the right eye, in the second, caused by an accidental clash of heads. Horvatic busy when on the inside, while Arthur boxing well at a distance in the third. Forth round, Arthur flowing and looking like he was enjoying himself, in there, hands low at times. Fifth and Arthur in full control, as he had been through the previous rounds. Lead uppercuts, stinging hooks and evasive head movement all on show from Jamie, against the outclassed Croatian. Martin Williams scored it 60-54 to Jamie Arthur and it was a clear victory. After a three year absence it was almost as if Jamie had never been away. The Welshman’s record is now 19-6, 4 KOs while Antonio Horvatic is 8-21, 5 KOs.